Great Plastic Clips For Pacifiers, Clothing Accessories, Head Fasteners or Name Badge Holders. You are viewing Lanyards > Clips > Plastic Clips For Flat Fabric Straps or Plastic Straps. Our SC-002 plastic clips are great design for a variety of applications, like making baby pacifiers, fashion clothing accessories, head fasteners, name badge lanyards. They are compact size 9/16" wide by 1 3/8" high. The 3/8"(W)x5/64"(H) hole on the top of plastic clips are great for 3/8"(w)x1/16" thick flat strap to go through. Most of the heavy duty fabric straps or plastic straps on the market can go through the strap hole easily. We keep large quantity of black, clear, red, purple, sky blue, burgundy, pink, navy blue, yellow, brown, green and light blue color clips in stock for small quantity retailers, general public buyers or large quantity wholesalers. Custom color of plastic clips or custom logo imprinting for your company's logo available. 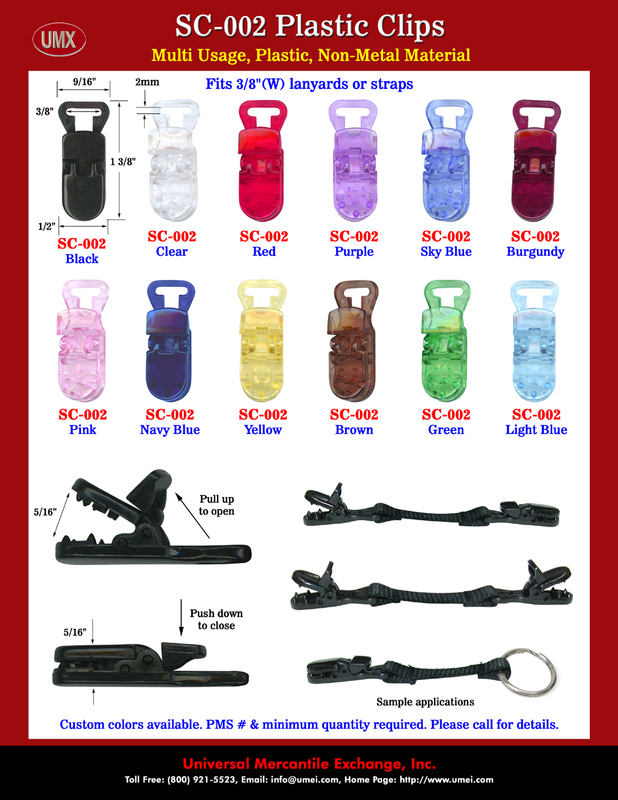 You are viewing Lanyards > Clips > 3/8" Strap Plastic Clips or Fabric Strap Clips With 12 Stylish Fashion Colors. Great Plastic Clips For Baby's Pacifiers, Clothing Accessories, Head Fasteners, or Name Badge Holders.